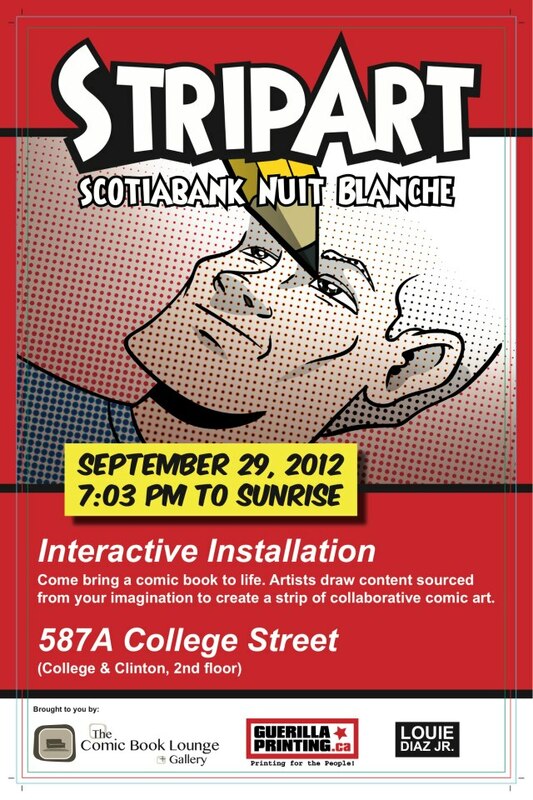 CHECK OUT StripArt at Nuit Blanche on Saturday,September 29th! This fully interactive installation will give you the opportunity to participate directly with the medium of the comic book. StripArt will remind people that comics were once drawings, illustrations, thought bubbles of exposition, paper, and panels of art and narrative. So, come bring a comic book to life. Artists draw content sourced from your imagination, continuing plot from panels created from other participants, to create a strip of collaborative comic art. PRESENTED BY GUERILLA PRINTING, THE COMIC BOOK LOUNGE and LOUIE DIAZ, JR.
AS THE INSTALLATION WILL TAKE PLACE AT 587A COLLEGE STREET, THE COMIC BOOK LOUNGE + GALLERY WILL REMAIN OPEN FOR THE DURATION OF THE EVENT. For one sleepless night, experience the city transformed by artists for Toronto’s seventh annual sunset-to-sunrise celebration of contemporary art. One night only. All night long. Choose from more than 150 projects! are you guys doing one again this year? No, Nuit Blanche does not allow for sites to do events for consecutive years. So, no official event this year – however we are holding a book launch/art show that night for Marco Rudy’s Marvel Knights Spider-Man #1.